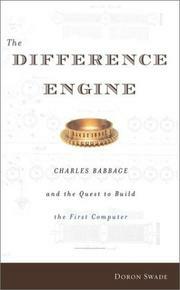 An account by London Science Museum director Swade (Charles Babbage and His Calculating Machine, not reviewed) of the work and influence of 19th-century English mathematician and inventor who was the first to proclaim the need for computers and describe their basic features. Computing is not the same as calculating. Cumbersome mechanical calculators, capable of performing fairly impressive mathematical operations, had existed for centuries. They could not, however, perform millions of such operations—although, by the 19th century, this was precisely what was required. Many professions routinely used entire volumes filled with nothing but calculations: navigational, astronomical, logarithmic, or chemical tables. Each calculation in these massive references had been performed by hand and, inevitably, errors crept in. More errors then appeared during transcribing and typesetting. It was maddening. When Babbage proposed an immense machine that could be programmed to calculate and print continually, almost everyone liked the idea, and the British government contributed a huge (for the time) sum of money for the research and development of the scheme. Babbage spent much of his own fortune and invested decades in the research, design, toil, quarrels, and personal disasters that produced sheaves of drawings and piles of parts but no complete machine. Eventually the government stopped contributing, and Babbage died a bitter man. The author has the expertise necessary to understand his subject’s ideas and, after telling the story, he asks the obvious question: Would the machines have worked? The answer comes in the final chapters, which describe a six-year effort to construct one of Babbage’s designs in time for the bicentennial of his birth in 1991. In man-hours, frustration, and sheer financial cost, the enterprise duplicated Babbage’s torments almost exactly, with one exception: The machine was built. And it worked. A moving and fascinating account of a brilliant man who failed in spite of his best efforts.